CORONA, CA -- CIRCOR Aerospace, Inc., a CIRCOR International company (NYSE:CIR), is pleased to congratulate NASA and the STS-133 crew on the launch of its final mission for space shuttle Discovery from Cape Canaveral, Florida. 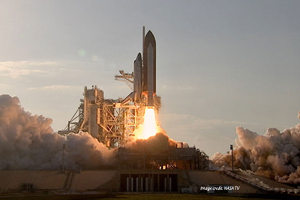 “CIRCOR Aerospace is proud to be a consistent and reliable supplier of systems and component controls for the space shuttle program and other commercial and government launch vehicles for over 30 years. We send our congratulations to the NASA team on this 39th and final flight for Discovery,” noted George Teets, CIRCOR Aerospace Fluid Controls Product Line Director. CIRCOR Aerospace California recently received a congratulatory visit and award from key members of the Shuttle Program, including Lockheed Martin and NASA. The CIRCOR team was recognized for long term partnership and service excellence for mission critical hardware. CIRCOR Aerospace will be one of the supplier partners featured on the Shuttle Monument at Florida’s Space View Park slated for dedication in the summer of 2012.